In this post, the author assembles a dataset of fake and real news and employs a Naive Bayes classifier in order to create a model to classify an article as fake or real based on its words and phrases. Since the 2016 presidential election, one topic dominating political discourse is the issue of “Fake News”. A number of political pundits claim that the rise of significantly biased and/or untrue news influenced the election, though a study by researchers from Stanford and New York University concluded otherwise. Nonetheless, fake news posts have exploited Facebook users’ feeds to propagate throughout the internet. Obviously, a deliberately misleading story is “fake news” but lately blathering social media discourse, is changing its definition. 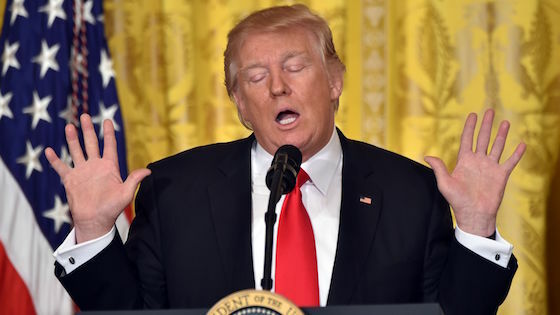 Some now use the term to dismiss facts counter to their preferred viewpoints, the most prominent example being President Trump. Such a vaguely-defined term is ripe for a cynical manipulation. The data science community has responded by taking action to fight the problem. There’s a Kaggle-style competition called the “Fake News Challenge” and Facebook is employing AI to filter fake news stories out of users’ feeds. Combating fake news is a classic text classification project with a straight-forward proposition: Can you build a model that can differentiate between “Real” news vs “Fake” news. And that’s exactly what I attempted to do for this project. I assembled a dataset of fake and real news and employed a Naive Bayes classifier in order to create a model to classify an article as fake or real based on its words and phrases. There were two parts to the data acquisition process, getting the “fake news” and getting the real news. The first part was quick, Kaggle released a fake news dataset comprising of 13,000 articles published during the 2016 election cycle. The second part was… a lot more difficult. To acquire the real news side of the dataset, I turned to All Sides, a website dedicated to hosting news and opinion articles from across the political spectrum. Articles on the website are categorized by topic (environment, economy, abortion, etc…) and by political leaning (left, center, and right). I used All Sides because it was the best way to web scrape thousands of articles from numerous media outlets of differing biases. Plus, it allowed to me download the full text of an article, something you cannot do with the New York Times and NPR APIs. After a long and arduous process I ended up scraping a total of 5279 articles. The articles in my real news dataset came from media organizations such as the New York Times, WSJ, Bloomberg, NPR, and the Guardian and were published in 2015 or 2016. I decided to construct my full dataset with equal parts fake and real articles, thus making my model’s null accuracy 50%. I randomly selected 5279 articles from my fake news dataset to use in my complete dataset and left the remaining articles to be used as a testing set when my model was complete. My finalized dataset was comprised of 10558 total articles with their headlines and full body text and their labels (real vs fake). The data is located here in this github repo. When I first started this project, I conceded that this would not be the perfect project. The purpose of this project was to see how far I could get in creating a fake news classification and what insights could be drawn from that, then used towards a better model. My game plan was to treat this project the same way as a routine spam detection project. Building a model based on a count vectorizer (using word tallies) or a tfidf matrix (word tallies relative to how often they’re used in other articles in your dataset) can only get you so far. These methods do not consider important qualities like the word ordering and context. It’s very possible for two articles that are similar in their word counts to be totally different in their meaning. I did not expect my model to be adept at handling fake and real articles whose words and phrases overlap. Nonetheless, I expect some valuable insights to come from this project. Since this is a text classification project, I only used a Naive Bayes classifier as is standard for text-based data science projects. The real work in formulating a model was the text transformation (count vectorizer vs tfidf vectorizer) and choosing which type of text to use (headlines vs full text). This gave me four pairs of reconfigured datasets to work with. The next step was to determine the most optimal parameters for either a countvectorizer or tfidf-vectorizer. For those of you who are unfamiliar with text machine learning, this means using a n-number of the most common words, using words and/or phrases, lower casing or not, removing stop words (common words such as the, when, and there) and only using words that appear at least a given number of times in a text corpus (a term for a text dataset or a collection of texts). To test the performance of multiple parameters and their numerous combinations, I utilized the Sci-kit Learn’s GridSearch functionality to efficiently execute this task. To learn more about how to perfect your algorithm parameters, please review this tutorial. After the grid search cross validation process, I found that my model worked best with a count vectorizer instead of a tfidf and produced higher scores when trained on the full text of articles instead of their headlines. The optimal parameters for count vectorizer are no lowercasing, two-word phrases not single words, and to only use words that appear at least three times in the corpus. Given my expectations that I outlined earlier in this post, I was surprised and almost baffled at the high scores my model produced. My model’s cross-validated accuracy score is 91.7%, recall (true positive rate) score is 92.6%, and its AUC score is 95%. Here is the ROC Curve for my model. If I were to decide on a threshold for a model based on this graph, I would choose one that produces a FPR at around 0.08 and a TPR at around 0.90, because at that point in the graph the trade off between false positives and true positives is equal. The true test of my model’s quality would be to see how fake news articles in the test set (those not used in the creation of my model) it could accurately classify. Out of the 5234 articles left in the other fake news datasets, my model was able to correctly identify 88.2% of them as fake. This is 3.5 percentage points lower than my cross-validated accuracy score, but in my opinion it is pretty decent evaluation of my model. It turns out that my hypothesis predicting that model would struggle at classifying news articles was quite wrong. I thought that an accuracy score in the upper 60s or lower 70s would be excellent and I managed to surpass that by a significant margin. Even though I created what appears to be a pretty good model given the complexity of the task, I am not entirely convinced that it is as good as it appears to be and here’s why. To be better understand why this might have happened, let’s take a look at the “fakest” and “realest” words in the data—I’ll explain what I mean by that. Using a technique I borrowed from Kevin Markham of Data School, here’s how I derived the “fakest” and “realest” words in the corpus. First I started off with a table two columns wide and 10558 rows long (that’s how many words there are in the corpus). The first column represented how many times a given word appeared in articles classified as “FAKE” and the second column was how many times a word appeared in a “REAL” article. Then I divided the fake column by the total number of fake articles my model classified and so on for the real column. Next, I added the number one to every value in the data because I created a new column of “Fake:Real” ratios and didn’t want to get an error by dividing zero. This “Fake:Real” is a pretty good but by no means perfect metric of just how “fake” or “real a certain word. The logic is pretty simple, if a word shows up a bunch in “fake” articles and rarely in “real” articles then its fake to real ratio score will be pretty high. 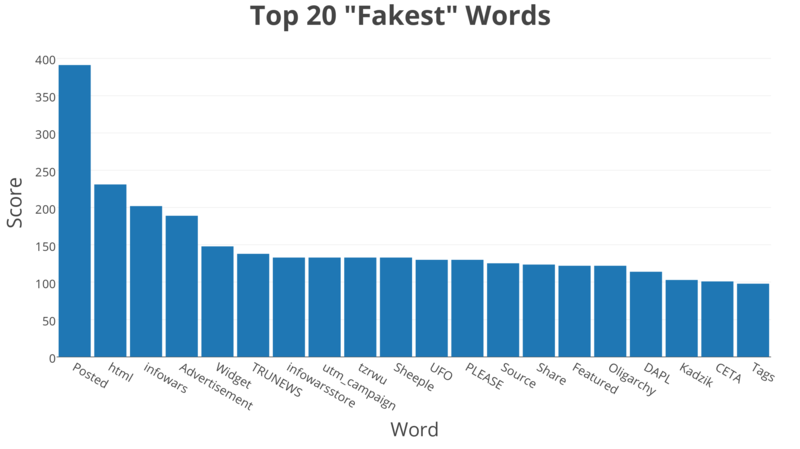 Here are the top 20 “fakest” and “realest” words in my dataset. These two graphics exhibit some baffling results. The words in the “fake” chart are a mixed bag that includes some typical internet terminology such as PLEASE, Share, Posted, html, and Widget and words that aren’t even words such as tzrwu. However I was not surprised to see infowars mentioned nor terms like “Sheeple” or “UFO” make it in the top 20 “fakest” words. Infowars is a right-wing conspiracy-laden outlet led by Alex Jones that promotes conspiracy theories about chemtrails and 9/11. 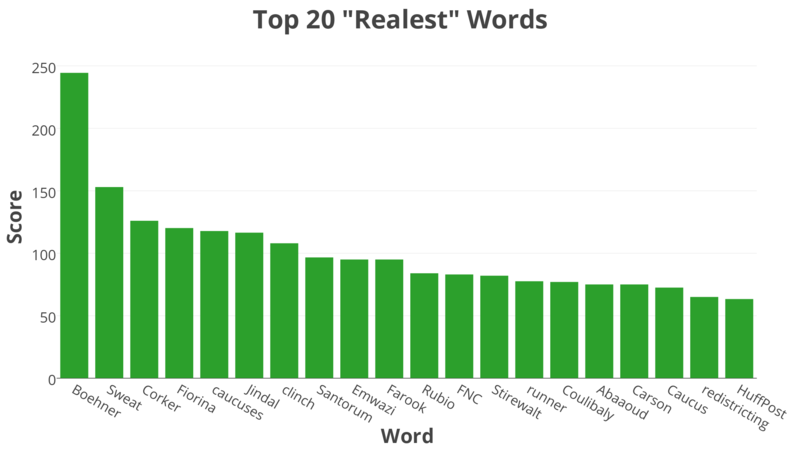 The “real” chart is dominated by names and politicians and words frequently used in political articles, comprising 60% of the bars in the chart. Seven of the twenty terms, including four of the top six, are politician names. This begs the question, are articles about politicians more likely to be true? No of course not, if anything you’d expect there to be numerous fake news articles spreading falsehoods about politicians. I would be committing a huge error if I came to the conclusion that articles mentioning politicians are more likely to be to factual. One big assumption underlying this project is that there is considerable overlap in the topics covered by each class of article. As we witnessed above, just because a certain word shows up more often in “real” news than “fake” news it doesn’t mean that articles with those terms are guaranteed to be “real”, but instead could just mean that those words are used in topics more common in the real news dataset and vice versa for the fake news dataset. I and another party had a considerable amount of influence in shaping this dataset. I made the decision on which articles to use for the “real” dataset. The articles in the “fake” dataset were determined by a chrome extension called “BS Detector” made by Daniel Sieradski. There is a significantly high amount of subjectivity going into determining what is and what isn’t “fake news”. The reason why politician names are rated as “real” so highly is most likely because that half of the corpura disproportionately comes from political news. In addition, I did find a couple of articles from what I find to be reputable sources of news. One such article came from The Intercept, a news organization with high journalism standards. And yes, my model did indeed flag this supposed “fake news” article as real. To make matters even more complicated, we have to decide how to set the threshold probability for our model. If I was a data scientist at Facebook tasked with implementing a model that sorts out real and fake news in users’ feeds, I’d be faced with the dilemma between choosing a model that blocks all or most fake news and some real news or a model that allows all or most real news and some fake news. But before I make that decision, I need to figure what is the cost of failing to prevent fake news vs the cost of blocking real news? How does one attempt to answer such an abstract question? Unless we can train a model with a 100% true positive rate and 0% false positive rate, we’ll be stuck with this quandary. 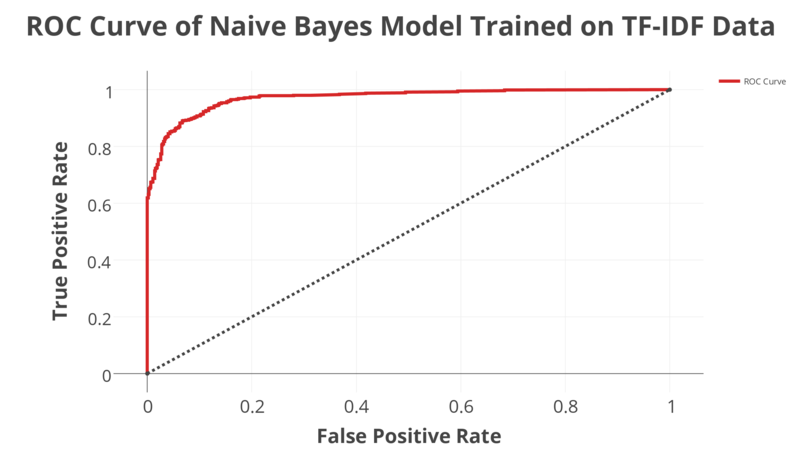 In conclusion, while I think that a standard Naive Bayes text classification model can provide insight into addressing this issue, a more powerful deep-learning tool should be employed to combat fake news in a professional setting. Classifying “fake news” provides a novel challenge to the data science community. In many machine learning projects, the distinction between the different classes you want to predict is clear, whereas it’s a lot murkier in this case. This project validates the notion in data science that intuition and intimacy with your data is just as or more important than any model or tool at your disposal. Bio: George McIntire is a journalist turned data scientist/journalist hybrid. Looking for opportunities in data science and/or journalism. Impossibly curious and passionate about learning new things. Before completing the Metis Data Science Bootcamp, he worked as a freelance journalist in San Francisco for Vice, Salon, SF Weekly, San Francisco Magazine, and more.